Coba were the first Mayan ruins we saw. 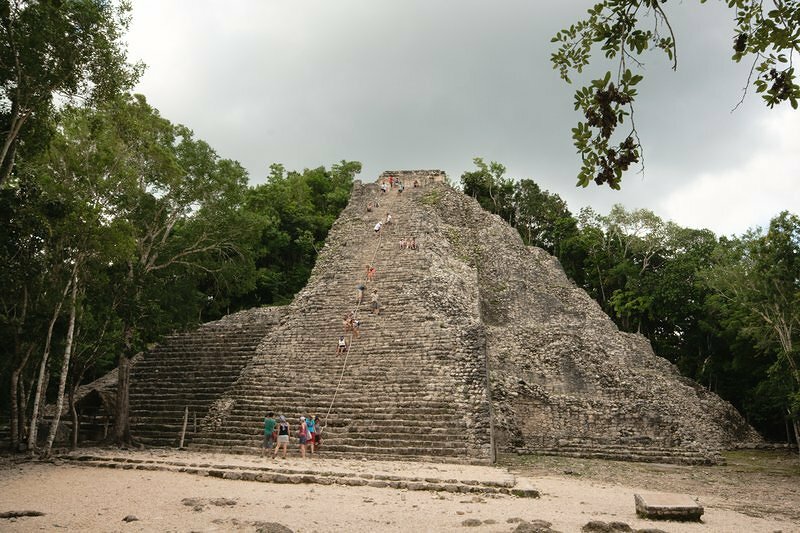 The guidebooks promise that Coba is uncrowded and off the beaten path. This is soooo not true anymore… it was blatantly apparent to us that tour buses have discovered it. Even though we took the earliest bus from Valladolid that we could, the ruins were packed with people when we arrived. Coba is located in the jungle near several crocodile-filled lakes. We didn’t actually see any crocodiles, but a group that was down the path from us did (apparently the tour guides regularly carry raw chicken to bait the crocodiles into coming out). Since we didn’t have any raw chicken, and didn’t feel like using our own flesh as bait, we didn’t venture too close. The ruins are quite spread out and you have the option of renting a bicycle for the day for 30 pesos (about $2.50 CAD) or hiring a tricycle taxi for a lot more than that. Not being in any kind of rush, we opted to walk. In retrospect, we should have coughed up the couple dollars for the bikes. Oh well… live and learn! Entrance is 51 pesos a person (just over $4.00 CAD). There are several guides at the main entrance willing to show you around for a substantial fee. We weren’t willing to pay somewhere in the neighbourhood of $20 CAD for a tour, so we just wondered around and caught bits information from other people’s tours. The ruins were okay, but they weren’t spectacular. They are in pretty rough shape, though the backdrop of the jungle makes up for it. 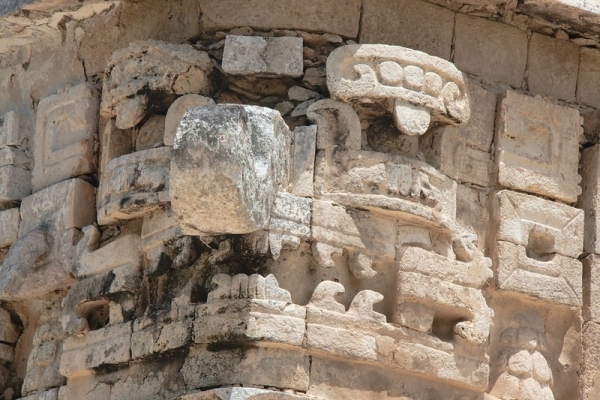 You need a pretty damn good imagination to see anything in the carvings though. There is one pyramid (Nohoch Mul) that you can climb, but it’s hardly a mystical experience when you get to the top, standing shoulder to shoulder with other sweaty tourists looking at the jungle in the blazing hot sun. 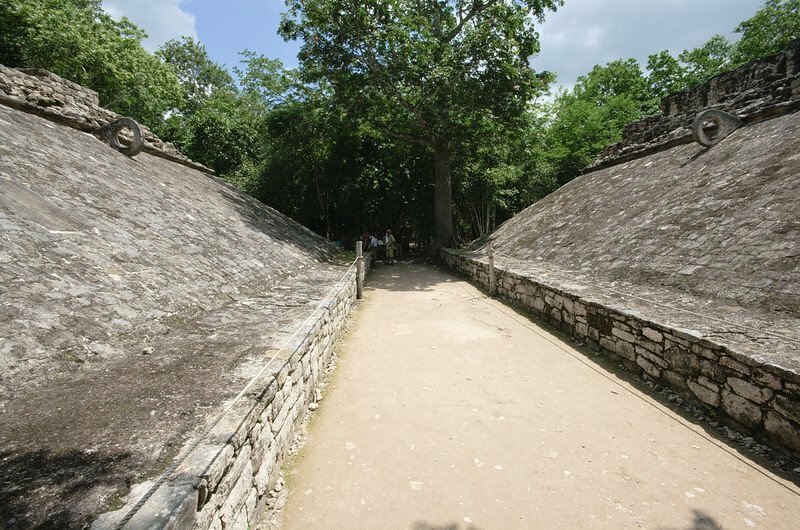 The sacbeob (raised stone roads, 1-2 m high) were really neat… Coba is thought to have been a trading centre because it seems to be at the crossroads of several of these roads. Overall, we enjoyed Coba, but would have enjoyed it a lot more if there were less people. 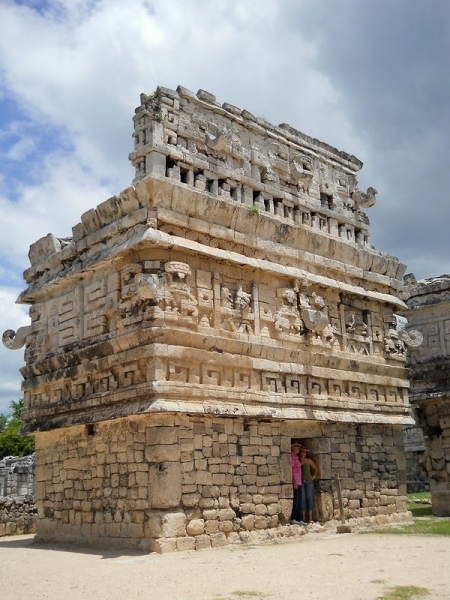 If we had to do it over again, we probably would have gone to Ek Balam (located just outside Valladolid) instead. The whole trip (bus from Valladolid and back, lunch in the town of Coba, admission to the ruins) only cost us $22 CAD and took most of the day. Chichen Itza was incredible. To be honest, I was expecting to be let down by the site. Everything we had heard and read said that it was ridiculously overcrowded. But we were not disappointed. 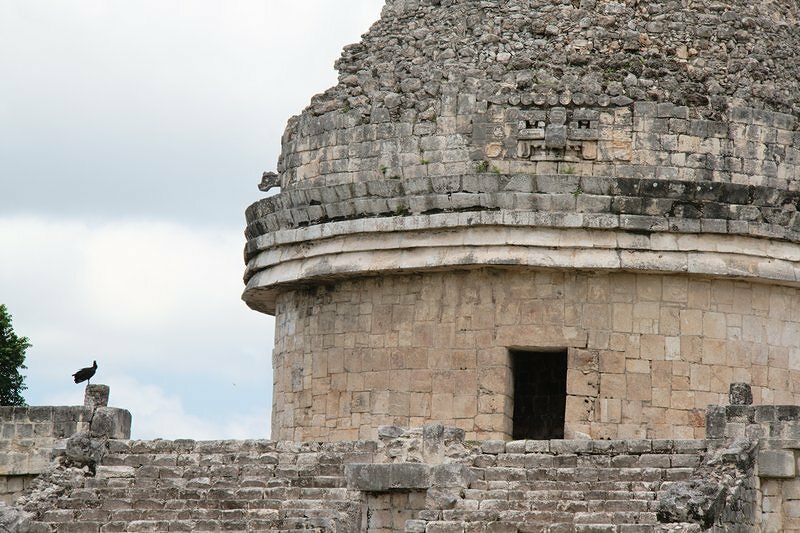 The earliest buses to Chichen Itza left the Valladolid station at 5:00 am, 6:00 am, and 8:15 am. We tried to buy tickets for the 6 am bus, but the lady behind the counter told us we couldn’t. She may have been telling us that the gates wouldn’t be open yet or she may have been trying to tell us it was raining chickens (our Spanish is pretty poor right now), so we cut our losses and bought tickets for 8:15 am. The tickets cost 20 pesos each. We arrived at the ruins at 9:00 to find… NO ONE. There was one lone tour bus in the parking lot, the ticket building was deserted, and there were only a few vendors along the paths starting to set up their wares. We had about an hour and a half to explore the ruins before other people really started to show up. It was so peaceful that we found a nice shady spot, pulled out our Kindles, and read our books amongst the ruins. El Castillo (a.k.a. Temple of Kukulcan) did not disappoint. It dominated the skyline and mesmerized me. I can definitely see why it is one of the seven wonders of the modern world. But Chichen Itza’s appeal goes far beyond the often photographed main pyramid. It has been restored to a far greater extent than Coba, and the carvings are much more defined. Some of our favourite buildings were the Observatory and the Church. By around 1:00 or 2:00 pm the place was packed and we were more than ready to escape the tourist madness. We had heard enough jaguar calls and pan flutes from the vendors for one day. We had two disappointments at Chichen Itza. First of all, the ball court was closed for maintenance. It’s supposed to have great acoustics and we were itching to try it out. Second, we made the mistake of not packing enough snacks. The only food to eat in the visitor centre is microwaved American cuisine (can you even call it cuisine?). In our deliriously hungry state, we forked over a whopping 75 pesos ($6.10 CAD) for a microwaved corn dog (no mustard!) and a doughy calzone. At the time, this was ashamedly our most expensive meal in Mexico. We were more than happy to leave the expensive food and packed visitor centre behind as we caught our bus to Merida. All in all, we spent about $43 CAD on this excursion, including transportation to the site, entrance fees, and our terrible lunch. And we would do it again (even the corn dog, if I had to). 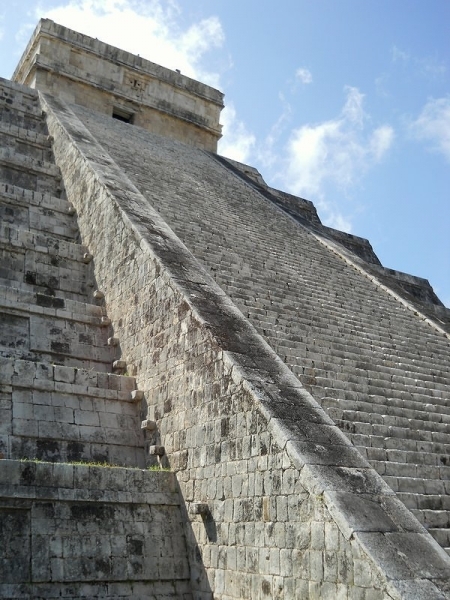 I would definitely recommend a visit to Chichen Itza to anyone traveling in Mexico. Go early though, and get out when the crowds start overtaking the place. Cost of Tour Guide: We were quoted $600 pesos for an English tour. If you want to do a tour, try to find more people to group up with… the cost is the same whether there are two people or ten. If you like our pictures, you can check out many more in our Mexican photo album! This looks like fun, large groups of tourists non-withstanding. I had a similar experience in Thailand where I went to a recommended “out of the way, off the beaten trail” town…that ended up being full of tourists, looking for an “off the beaten track” experience. It was still fun, though, just not what I was expecting! I think everyone is looking for an “off the beaten path” kind of place. So they all go to the one the guide books recommend and voila… crowds! You’re right though, even with large groups of tourists the experience can be amazing. My biggest disappoint is that you can’t go inside most of the temples any more. At Palenque, you can walk through the palace and really adds another level of understanding when you can see the inside of the building. They are fascinating. Their 2012 prediction however was not a prediction of the end of the world, but the start of a new cycle. Not an end, but a beginning. I read something about three months ago that said some present day descendents of the Mayans were trying to explain that 2012 is the start of a new cycle, not the end of the world. Unfortunately the media likes the sound of “doomsday” better so we are all stuck with end of the world talk until 2013.